The Combined Services Memorial at Westminster Abbey was unveiled on the 21st May 1948 by the Right Honourable Sir Winston Churchill KG PC. It was designed by the sculptor Gilbert Ledward, with three bronze figures in stone niches, with the dates 1939 and 1945 on tablets between. The models for the figures were serving members of the forces – the submariner was modelled on Leading Seaman Reginald Read, the Commando on Company Sergeant Major Ayres, and the representative of the Parachute Regiment was Corporal Howard Elliott. A Roll of Honour for Commandos is on display in a case in the nave of the Abbey and the Commando Association Battle Honours flag is framed and displayed on the wall in St George’s chapel. The Roll was pesented to the Abbey in 1949 by officers of the Commando Depot and completed though the generosity of Brigadier R.J.F.Tod. A thanksgiving service with dedication of the Battle Honours Flag took place on the 15th April 1961. Each year there is a small informal wreath laying Sevice at this Memorial. The service, arranged by the London branch of the Commando Veterans Association, usually is at 2pm on the Saturday of Remembrance weekend. Use the Contact Form, selecting the category Association Events, to ask for confirmation of this year's timings. 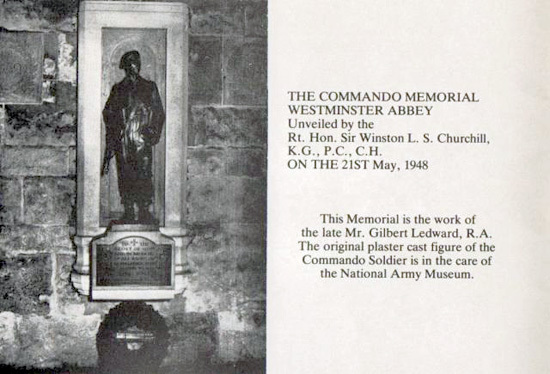 15th April 1961 Dedication of the Commando Association Battle Honours Flag at Westminster Abbey. Narrated by Henry Brown OBE. Registering on the Commando Veterans Archive, or on the Commando Veterans Association Facebook page, does not make you a member of the Association. 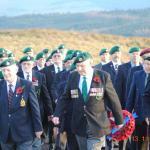 The Commando Veterans Assciation needs your support and membership. Find out more here.